Being as I only wear makeup on occasion I often neglect to take care of my makeup brushes properly. Time seems to get away from me and before I know it months, or possibly even a year or more will go by in-between my brush cleanings. This is really not a good thing. I mean take a look at my uncleaned brushes above. Um.... yuck!!!! Besides that they are obviously quite dirty, what you can't see is all of the bacteria that are squirming around on those icky brushes. Think about it for a minute. 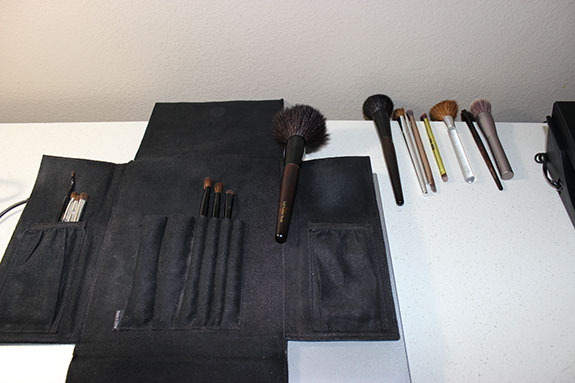 We use these brushes to apply makeup to our faces, which, even if clean, contain lots of bacteria. We brush it all around, and then most likely, like me, we put our brushes back into whatever holds them. And then they sit. Yuck! Ick! You can see the simplicity of it. 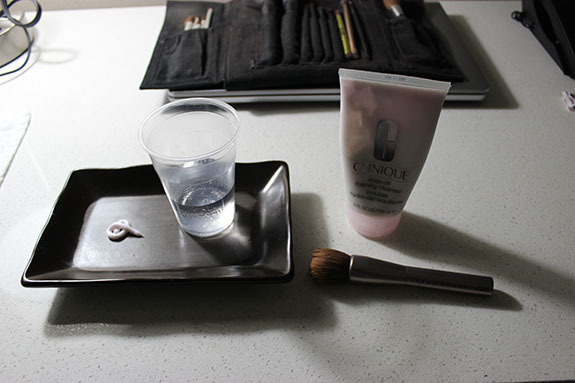 A cup of clean plain water, some regular makeup cleanser, and a dirty brush. This happens to by one of my dirtier brushes that is used for my foundation. My brush is from Urban Decay. It is the Good Karma Radial Blurring Brush. I am using Clinique's Rinse-Off Foaming Cleanser. The process is fairly simple. 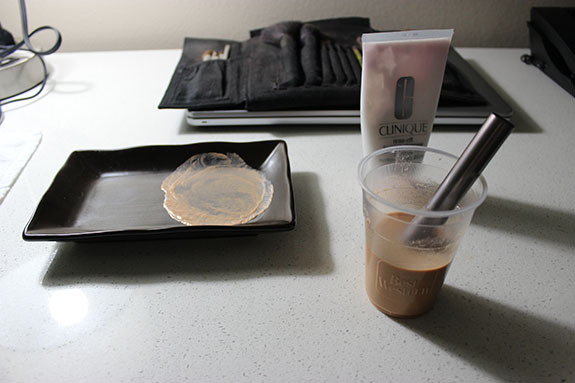 I wet the brush, then swirl it around in a glob of the makeup remover, and then rinse the brush in the cup of water. I will then rinse out the brush under running water until it runs clear. Lastly, I will gently squeeze out the water with a soft clean towel and lay the brush on it's side over the edge of a counter for it to air dry. Generally by the next morning they are ready to go. Of course I would expect my foundation brush to be extremely dirty as I use a liquid foundation that obviously soaks deeply into the brush. 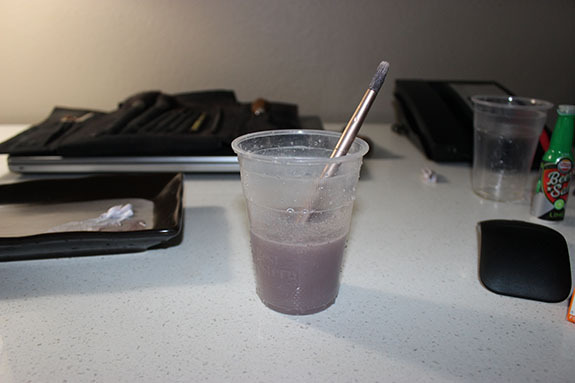 Thus the nice dark milk-chocolate colored water that I get while rinsing out the brush. But another brush that also needs to be cleaned frequently is my eye shadow brush. With the eye shadow brush (from Urban Decay's Naked 2 Palette) it is possibly even more important that you clean it regularly. With that brush, you swirl it in the color, apply it to your eyes, and then if you are like me, you will put it back into the eye shadow and gather some more product before applying it to your eyelids again. This means that the brush touches your face and then goes back into the product, transferring anything on your eyelids into the product. Um.... a bit of yuck! As you can obviously see. It is important to regularly clean your brushes. If I really thought all that much about the ickiness factor I would probably clean my brushes WAY more often! As it is, I generally clean them about once every month or two. My wife, who uses her makeup almost daily cleans her brushes more. Which is probably a really good thing to do!! 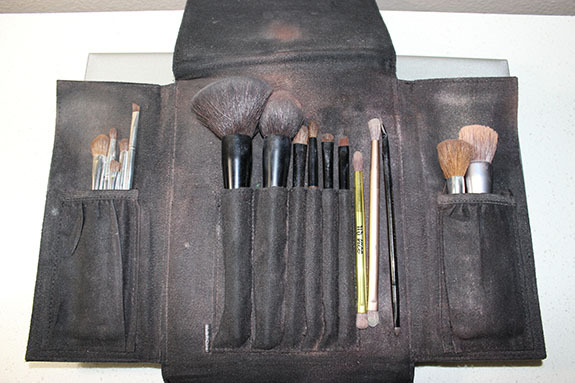 But what you need to remember is not the amount you use your brushes, but the amount of time in between cleanings. Even if you only use it once, and then store it for an extended period of time, bacteria will most likely be growing on it. If you then go and use it, you will be smearing that bacteria all over your face. Which can cause all sorts of skin problems for you! So, point being.... I should clean my brushes more often! And maybe you should too!